It’s almost been 100 years since Paul Sabatier was awarded the 1912 Nobel prize for his discovery that hydrogen gas will add to alkenes (among other molecules, such as CO2) when both are passed over finely powdered metals. This general reaction – “hydrogenation” – by which C–C (π) bonds are broken and C–H bonds are formed, was an extremely useful discovery that is still carried out on multi-ton scale today. The main industrial use of hydrogenation is in preparation of saturated fats from unsaturated fats, which makes them less likely to spoil. What lasts longer in your fridge, butter or margerine? You can thank the hydrogenation for that. Hydrogenation is also to blame for trans fats, but that’s another story. While finely divided nickel was originally Sabatier’s catalyst of choice, extensive experimentation with other metals have shown that palladium, platinum, rhodium, and other “late” metals are also capable of assisting this transformation. Although the first image of platinum that might come to mind is that of a gleaming metal, in practice these reactions are very surface area dependent, and work much better when the finely divided, powdered form is used. This is generally called the “black” form. I can’t find a good picture of platinum black but here is a picture of the related platinum oxide. It’s pretty far from what you might expect to see at first glance for a “shiny” element like platinum. In practice it can be a bit of a pain to weigh out trace amounts of expensive platinum or palladium metal to run reactions on small scale, so it’s more convenient to use a prepared mixture where the metal has been absorbed on a cheap, high surface area material like charcoal. The resulting palladium on carbon (Pd/C) or platinum on carbon (Pt/C) is the bench chemists’ workhorse reagent for hydrogenation reactions. So how does it get used? All kinds of useful ways. First of all as already described Pd/C will reduce alkenes to alkanes when hydrogen is also present. It’s important to note that the to hydrogens from the alkene are delivered syn (i.e. the same face of the alkene). Pd/C and hydrogen will reduce alkynes all the way to alkanes – that is, two equivalents of H2 are added. Contrast that to Lindlar’s catalyst, which only adds one equivalent of H2 (but also in syn fashion). 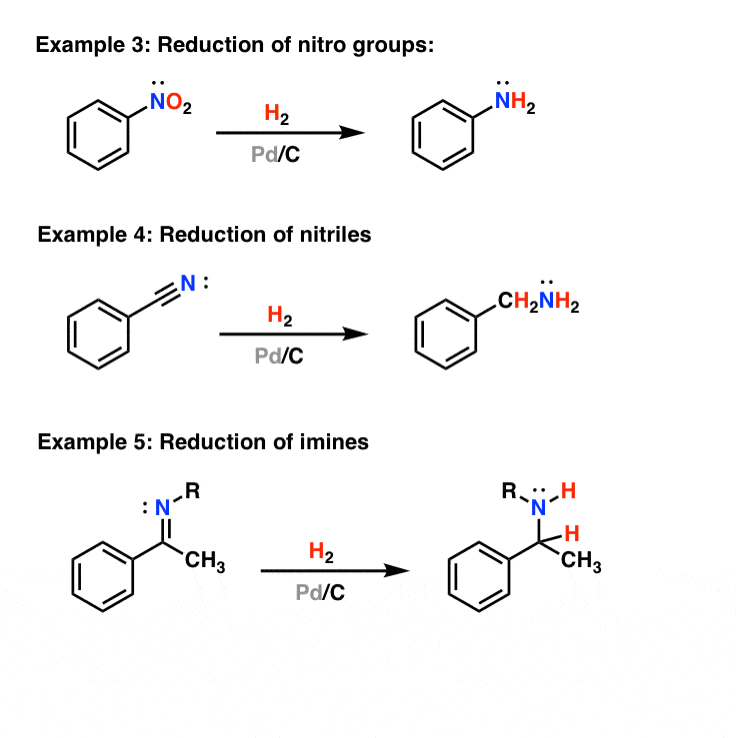 Pd/C and hydrogen will also reduce other multiple bonds, such as NO2 (nitro groups), CN (nitriles) and C=NR (imines). Finally, if enough heat and pressure is added, Pd/C and hydrogen gas will also reduce aromatic groups such as benzene. Note that this reaction is considerably more difficult than reducing a “normal” double bond due to the greater stability of the aromatic benzene ring. It’s important to note that Pd/C is a catalyst in all of these reactions, meaning that it accelerates the rate of reactions but is not itself consumed. That is, Pd/C is a lot like a matchmaker who brings couples together, but never gets married himself. Another analogy is to think of the surface of Pd/C as kind of like a singles bar, where hydrogen and alkenes (or other organic compounds) meet, react, and leave together. Note that the hydrogen is always delivered to the same face of the alkene (“syn” addition). It’s also possible to substitute the heavy isomer of hydrogen (deuterium, D) for H2, which will deliver D to the alkene. P.S. You can read about the chemistry of Pd/C and more than 80 other reagents in undergraduate organic chemistry in the “Organic Chemistry Reagent Guide”, available here as a downloadable PDF. The Reagents App is also available for iPhone, click on the icon below! Hey there! I really appreciate this website, it’s been a lifesaver since I started Organic Chemistry! I have a question about Pd/C H2 — does it reduce carbonyls as well as alkenes/alkynes? It *can*, although generally higher pressures of H2 are required for reducing carbonyls. how can calculate equivalent of Pd/C for reduction of nitro is there any specific equivalent? Hahaha… The matchmaker example was excellent.. That just brought the laugh.. Enjoyed reading.. Understood well.. Thanks!! !